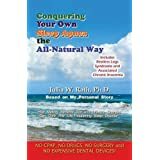 debunks many myths about apnea, chronic insomnia, restless legs syndrome (RLS), and treatments for these sleep disorders. You can have sleep apnea even if you are not obese or overweight. Men and women of all racial and ethnic groups can get apnea, but a good deal of our knowledge about this disease has been largely based on research conducted on obese white men. You can acquire apnea at any age; it’s not limited to adults. Children are getting it in record numbers today. Sleep apnea does not “progress” from loud snoring, but snoring may be one indicator of apnea. Apnea does not have to be diagnosed through a sleep study in a sleep laboratory. The CPAP machine is not the “gold standard” for treatment if you don’t use it. You probably don’t need it! Sleep apnea and chronic insomnia may be tied to consuming certain genetically-modified foods and food ingredients. Have been diagnosed with sleep apnea or chronic insomnia by a medical professional. Have self-diagnosed your own sleeplessness, breathlessness, choking, panic attacks, or apnea-like symptoms at night. Believe that you have chronic insomnia or RLS but have no idea what may have caused it or why it is so persistent. Are extremely tired during the day and suspect that you have a sleep problem—or know somebody who does!